Instant pot chana masala recipe – White chickpeas are cooked with spicy onion tomato gravy. As the name says we are using Instant pot to make this chole masala, but the same can be made in regular pressure cooker too. I won’t say that this is quick to make in instant pot. 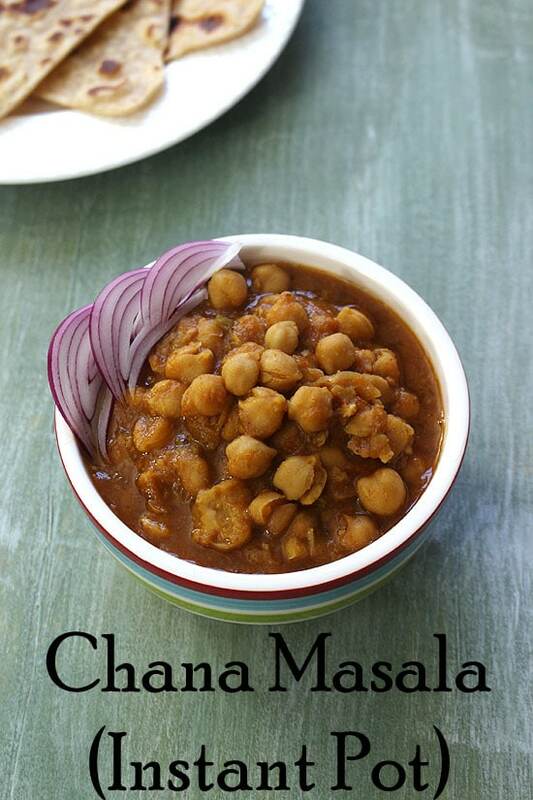 It takes same time as the regular chole or chana masala recipe made on stove top. But the main advantage of using this gadget is you do not have to babysit it. Put the timer and do other things. No need to count whistles or no need to worry about sticking to the bottom of the pan. That’s good deal, right? Now what about the taste of this Instant pot chana masala? Yes it tastes exact same, no difference. The gravy is spicy, slightly tangy and thick. 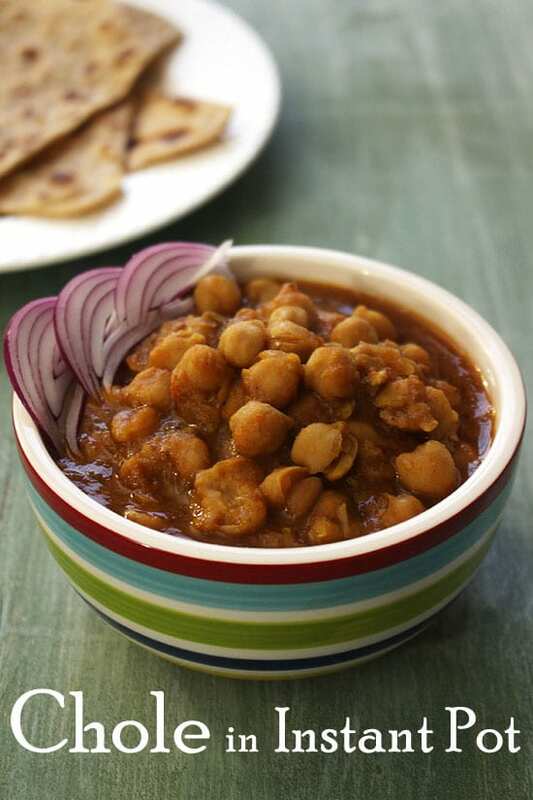 The chana is cooked to the perfection that are soft and melt in your mouth. Here I have used ready made chana masala powder just to make it quick. But if you want you can make freshly ground masala powder by following this chole recipe. 1) Wash the dried chickpeas under running cold water till water runs clear. 2) Soak them in enough water for 8 hours or overnight. After the soaking time discard the water and keep chickpeas aside. 3) Turn on the instant pot with saute mode. Add oil in it and let it get heat up. Once the oil is hot, add bay leaf, cloves and black cardamoms. Cook for 30 seconds. 4) Then add chopped onions, sprinkle pinch of salt to speed up the process. 5) Cook till onions get soft and light pink in color. It may take around 2-3 minutes. 6) Then add ginger paste, garlic paste and green chili. Mix and cook for 40 seconds or till the raw smell of ginger garlic goes away. 7) Now mix in tomato puree. 8) Let it simmer and cook till all the water dries up and it becomes like a thick paste. It may take around 5-6 minutes. 9) Then add remaining salt, turmeric powder, red chili powder, coriander powder, chana masala powder and anardana powder. 10) Mix well and cook for 30-40 seconds. 11) Then add soaked chickpeas. 12) Also add water and mix well. 13) Close the lid, Keep the vent on sealing position. Now change the setting to Manual mode (high pressure) and set 25 minutes. 14) After that time, Once it beeps let the pressure release naturally for 10 minutes only. Then manually release the pressure by changing the vent position. Once the pin drops, open the lid. 15) Lastly add amchur powder. 16) Mix well and it is ready to serve. NOTE: if the gravy looks watery, you can turn the saute mode on and let the gravy simmer for few minutes or till you get desired consistency. But if you have followed the water ratio as mentioned, you won’t have watery gravy issue. Serving suggestion: Serve with basmati rice or jeera rice. It can be served with paratha, poori or bhatura. Serve pickle and sliced onions w/ lemon wedges on side. Wash the chickpeas and soak in enough water for 8 hours or overnight. After that drain the water. Turn on the instant pot with saute mode. Add oil in it and once it gets hot add bay leaf, cloves and black cardamoms, cook for 30 seconds. Now mix in onion with pinch of salt. Cook till onions are soft and light pink. Then add tomato puree and cook till all the water evaporates and becomes thick paste. Now add remaining salt and all the spice powders except amchur. Mix and cook for 40 seconds. Then mix in chickpeas and water. Close the lid, Keep the vent on sealing position. Now change the setting to Manual mode (high pressure) and set 25 minutes. After that time, Once it beeps let the pressure release naturally for 10 minutes only. Then manually release the pressure by changing the vent position. Once the pin drops, open the lid. Lastly mix in amchur powder and serve. Going to try this – any difference in timing for canned chickpeas? Thanks! reduce the water amount and cook on manual for 10-15 minutes only. Yes please post pot in pot recipe. Thanks Kanan. Your recipes are awesome. yes more IP recipes coming soon. I have some Everest chole masala. Can I use this instead of the Chana masala powder and if so should I adjust the other spices? No need to adjust. Actually both (chana masala powder and chole masala powder) are same. Different brands may use different name. Also yes please post complete meals with instant pot recipes- I know many people who would love this!